Copyright © 2019 Jameel et al. This is an open access article distributed under the Creative Commons Attribution License, which permits unrestricted use, distribution, and reproduction in any medium, provided the original work is properly cited. Bovine ocular squamous cell carcinoma is regarded as the most frequently diagnosed cancerous tumors in the eye. Anson et al. (1982) was detecting bovine herpes virus antigen in the cytoplasm of tumor cells by using the indirect immunofluorescence technique. Cattle between three to seven years age are targeted. The most intended areas of this tumor are: the limbus or sclero-corneal junction, third eyelid, and on the margins of the lower and upper eyelid. Parotid and submandibular lymph nodes around the head and neck are the common sites of spreading of this tumor (Dubielzig, 2002). The development of ocular tumors included four common stages, the first three stages are benign; carcinomas are malignant due to its ability to spread to underlying tissues. Carcinoma appears nodular and cauliflower-like, bloody, ulcerated, friable, and foul smelling after contamination (Aiello and Moses, 2016). Diagnosis is based on clinical signs and confirmed by histopathology . Biopsy or tissues scraping for DNA identification by using polymerase chain Reaction (PCR) technique to consider as modern methods of diagnoses (Perino et al., 1993). Professional veterinarians had been recognized this case and other diseases which confused with (BOSCC) as, conjunctivitis and ocular congenital deformity. Different forms of therapy have been developed to treat cancer of the eye, including surgical intervene, radiation, hyperthermia, cryosurgery, and immunotherapy had been followed. The location of the tumor and the degree of invasion of the underlying tissue determining the success of treatment. Some surgical procedures include third eyelid resection, eyelid wedge resection and in other cases enucleating of the entire globe and lid margins (Gharagozlou et al., 2007). The treatment with surgical methods do not always mean a cure, because 40-50% recurrence rate can be expected if the cancer has spread to regional lymph nodes and the tumor will continue to grow at those sites. 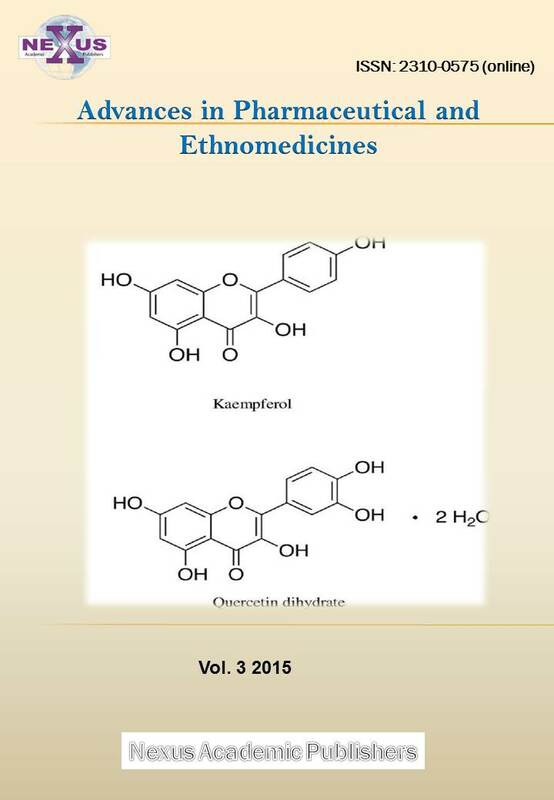 Ivermectin is macrocyclic lactones are products or chemical derivatives of soil microorganisms belonging to the Streptomyces avermitilis fungus. The main uses of ivermectin in the treatment of intestinal helminth infections as strongyloidiasis, onchocerciasis and heart worm. 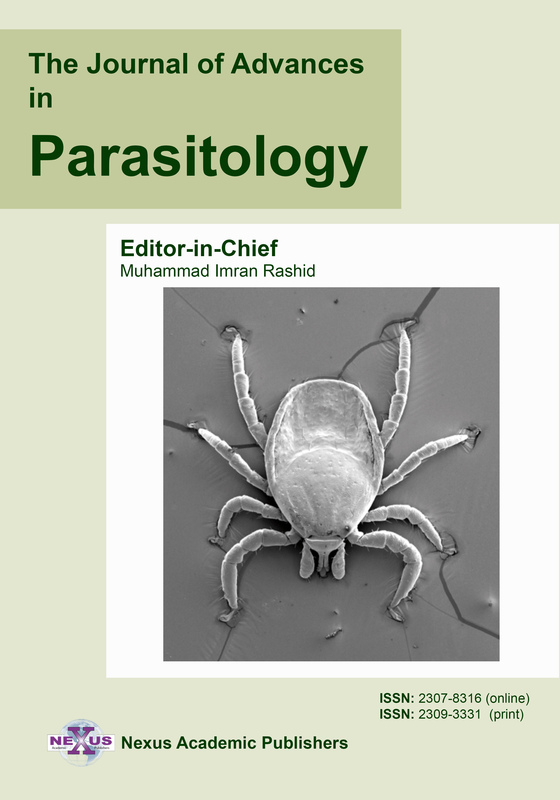 It is also active agents in the treatment of ectoparasites like ticks, mites and lice (Yates and Wolstenholme,2004). About three decades ago, a soluble cytokine termed tumor necrosis factor (TNF) has been identified that is caused tumor necrosis in certain animal model systems (Kriegler et al.,1988; Baud and Karin, 2001). Tumor Necrosis Factor (TNF) (also known as cachectin or TNF alpha) is a cytokine that has a wide variety of functions. It can cause cytolysis of certain tumor cell lines; it is involved in the induction of cachexia; it is a potent pyrogen, causing fever by direct action or by stimulation of interleukin-1 secretion; it can stimulate cell proliferation and induce cell differentiation under certain conditions (Sun and Fink, 2007). This study aims to evaluate the efficacy of ivermectin in the treatment of (BOSCC). This study was conducted on forty Friesian cattle (female), their ages between (5-10) years and divided into two groups. 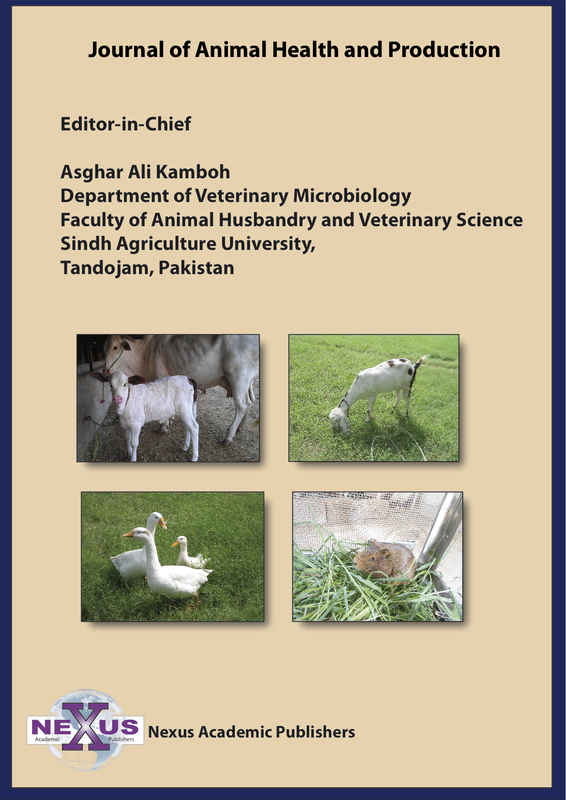 Scientific, ethical committee for College of Veterinary Medicine, University of Diyala, approved this study. First group (infected group) includes (20) cattle were symptomatically infected with ocular squamous cell carcinoma under different degrees of infection. The second group (control group) includes (20) cattle were none infected. Promectin (Ivermectin 1%) is manufactured by (Invesa Company, Spain) used in a dose 200 mg/Kg. subcutaneously to treat the infected cattle (Bogan and McKellar, 1988). The same dose repeated when (11) days were passed according to the instruction of the manufactured company. Fifteen milliliters of blood were pulled from the jugular vein of infected and noninfected cattle at the first day of treatment. Five milliliters of blood put in K3 EDTA vials to determinate the whole and differential white blood cells count. Ten milliliters of blood put in plane tubes for serum separation and, the serum reserves at (-20) C° till it is used for determination of TNF- alpha level. This operation would be repeated only to treat cattle when the third dose was applied. The kit (ab193683- TNF alpha, Bovine ELISA Kit) product of abcam company (UK, EU and ROW) has been used. From recovered animal, five milliliters of blood have been taken to determinate the whole and differential white blood cells count (Schalm et al., 1975). Immunohistochemistry for BRAF protein expression was performed on 4 mm-thick sections of formalin-fixed, paraffin-embedded tissues, using the Ventana BRAF V600E (VE1) Mouse Monoclonal Primary Antibody on Ventana Benchmark IHC automated slide strainer in combination with the Opti View DAB IHC detection kit. The specimens were fixed in 10% neutral buffered formalin for 24–48 hours. Negative and positive controls were included in each round of analysis. Briefly, after deparaffinization, the slides were pretreated with cell conditioning 1 for 64 minutes for antigen unmasking and followed by pre-primary antibody peroxidase inhibition. The slides were then incubated with the VE1 antibody at 37°C for 16 minutes, and counterstained with hematoxylin II for 4 minutes and bluing reagent for 4 minutes. The staining pattern for anti-BRAF V600E (VE1) antibody is cytoplasmic staining of tumor cells. 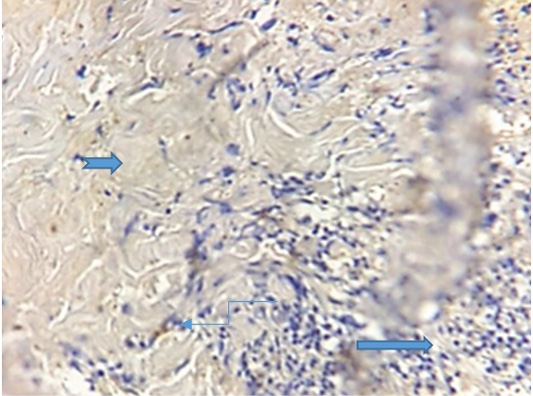 The cases of cytoplasmic staining in tumor cells are positive when the anti-BRAF V600E (VE1) antibody is used and no staining when the negative control is selected (Qiu et al.,2015). The data were presented at mean ± SD. Statistical analysis is done by Dunnett t-tests and Pearson Correlation. Significantly was depended at P ≤ 0.05 (Dunnett,1955). In this study ivermectin is used in the treatment of bovine ocular squamous cell carcinoma (BOSCC). The results in the figure (1-a) and (2-a) were give the gross appearance of the carcinic mass in the third eyelid and the limbus of the eye before the treatment respectively. The cancerous mass in the figure (1) has been in contact with the eyeball result in eye lachrymation, slight bleeding and may be led to complete corneal opacity or damage if progressed. The size of the mass was decreased after each injection about 0.5 to 1 cm. every twenty days of injection. The result in the figure (2-b,c) was showed the effect of treatment with the ivermectin at a dose 200 mg/Kg in and cause degradation of the lesionin the limbus (sclera-corneal junction) as a plaque and carcinic mass in the third eyelid has been appear as a scar. Figure 2: a) represent the lesion in the limbus (sclera-corneal junction) as a plaque and carcinic mass in the third eyelid appear as a scar. (b and c): represent the degradation of the lesion after treatment with two doses of ivermectin result in clearance of the eye. The results of immunohistochemical staining showed the cross section through conjunctiva that represent an inner layer of the eyelid and lined with stratified columnar epithelium which contain numerous goblet cells with evidence of vacuolation, sloughing of epithelial cells lining it and the lumen contain inflammatory exudate (conjunctivitis) and supporting by highly vascular connective tissue. The biopsy has been taken after 11 days of treatment (Figure 3). The figure (4) revealed vacuolation in some areas within inflammatory cellular aggregation mostly lymphocytes seen in the supporting tissue of the eyelid .Severe congestion of blood vessels (After 33 days of treatment). While the fifth Figure, revealed severe exudation and vascularization in the right side with fibrinous deposition progressed to form a scar on the left. The table (1) is represented the total and differential count of white blood cells of infected cattle before and after treatment with ivermectin and after recovery. The result of this study was revealed significant differences (P≤0.05) in the mean of total white blood cells count (5.39 ± 1.052) cell/mm3 before treatment and reach to (6.49 ± 0.422) cell/mm3 after treatment and the mean of lymphocyte rate (34.5 ± 3.20)% before treatment and reach to (60.6±10.83)% after treatment. Also, there was significant depression (P≤0.05) in the mean of neutrophils and monocytes rates (59.4 ±4.52)%, (4.3 ±1.40)% before treatment compare with percentage of cells after treatment were (34.4 ±9.56) %, (2.2 ± 1.15)% respectively. Figure 4: Show congestion of the blood vessels ( ), vaculation ( ) and presence of sebaceous gland ( ). (Dapi stain X10). Table 1: Total and differential white blood cells count of infected cows. * Significant differences at (P≤0.05). Data presented as mean ±SD. The results in table (2) showed the correlation between the TNF-alpha level of infected cattle before and after treatment and control group. 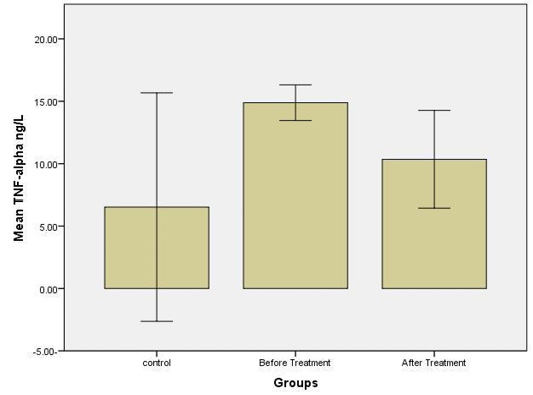 The results shown non-significant weak negative correlation with the level of TNF-alpha concentration between before treatment group and after treatment group, this result may be significant if the increase number of samples. 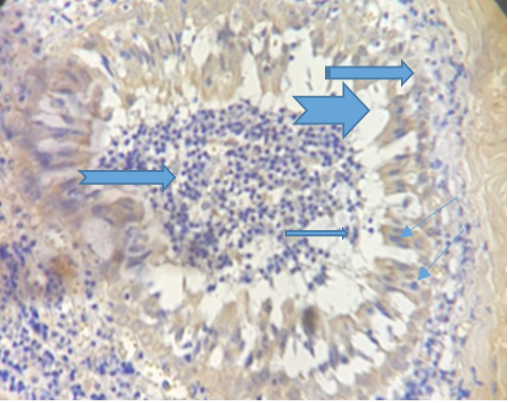 Figure 5: Photograph for immunohistochemical section of conjunctiva showing sever exudation ( ), vascularization ( ) and fibrinous deposition ( ). (Dapi stain X10). The results were shown a higher significant concentration (p≤ 0.05) of TNF-alpha level in the group before treatment, at a concentration (14.9 ± 0.48) ng/L compared with other groups; control at a concentration (6.5 ± 3.1) ng/L and group after treatment at a concentration (10.1 ± 1.1) ng/L (Figure 6). Figure 6: Revealed Levels of TNF-Alpha. Significant differences at (P≤0.05). Forty cattle were included in this study, twenty of them were infected with eye cancer and others were a control group. Statistical analysis of the results in a table (1) was revealed significant elevation (P≤0.05) in the mean values of the total count of the white blood cells and the lymphocytes .The mean values of total count of white blood cells are raised in treated cattle from (5.39 ±1.052) thousand cell before treatment and reaches for (6.49 ±0.422) thousand cell after treatment. The mean values of the lymphocytes were (34.5±3.20)% before treatment and reaches to (60.6 ±10.83) % after treatment. 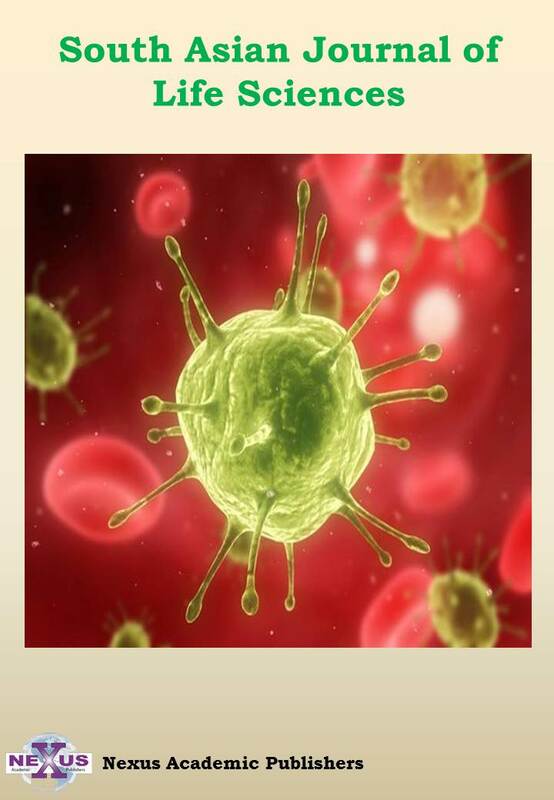 These results were reflected the Ivermectin effect on the cellular immune response of the animal against the pathogens and foreign particles which lead to cancer when the animal is immunosuppressed. These results are supported by a previous study which was suggested an immunopotentiating effect of Ivermectin at higher doses (Sajid et al., 2007). One of the components of the lymphocytes is T – cell , it can be distinguished from others by the presence of a special receptor on it᾿s surface called T cell receptors (TCR) and play an important role in cell – mediated immunity as virally infected cells and tumor cells (Schwarz and Bhandoola, 2006). There is an other T – cell called (NKT) natural killer T – cells, which able to recognize and eliminate many tumor cells (Barton et al.,1998). Quinn et al. (2011) were describes the natural killer T – cells by their origination from bone marrow, large granular mononuclear cells, cytotoxic lymphocytes, distinct from T lymphocytes and B lymphocytes, which contribute to innate immune responses by destroying virus- infected cells; activate macrophages by secreting interferon-γ and also destroy tumor cells; do not posses clonally distributed antigen receptors like immunoglobulins or T cell receptors because, the NK cells have receptors for the Fc portion of IgG, they can participate in antibody-dependent cell-mediated cytotoxicity with resultant destruction of target cells with antibody bound to their surfaces. Also may be stimulated antigen-activated T cells to produce Interleukin-2(IL--2) which stimulates the proliferation and effector functions of natural killer cells and B cells (Abbas et al.,2000). This illative is supported by Stewart et al. (2006) study who proves the efficacy of different doses of Interleukin-2 in peritumoural injections in regression of BOSCC specially on the third eyelid and limbus by his effect on innate immunity such as stimulation of neutrophils and macrophages due to vascular leakage. The depression in the TNF-alpha level appeared in the figure (6) is the best indicator for relief of the inflammation after the injection of ivermectin, which affect the blood supply operation result in degradation of the tumor mass and clearance of the eye and agreed with Swardfager et al. (2010) whose refers to the primary role of TNF to induce fever, apoptosis, cachexia, inflammation and inhibit tumor genesis and respond to sepsis via cells producing IL1 and IL6, so the mean value of the TNF-alpha level of infected animals was (14.9 ± 0.48) ng\ liter before treatment and depressed to (10.1± 1.1) ng/L after treatment when compared with the mean values of control group was (6.5±3.1) ng/L. This study was agreed with Ci et al. 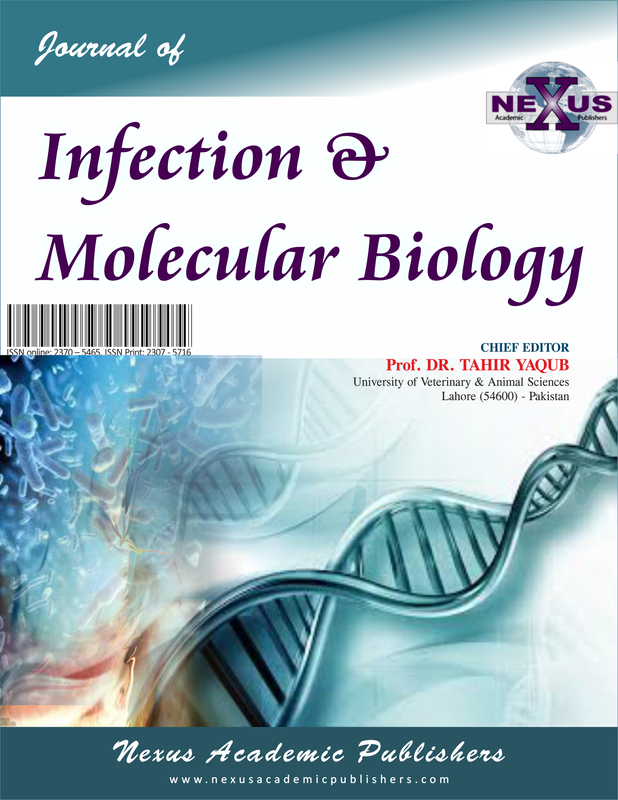 (2009) whose found that Ivermectin possesses a significant anti-inflammatory effects by inhibition of lipopolysaccharide-induced production of inflammatory cytokines such as TNF and IL1 through inhibition of nuclear factor-kappa B pathway and the upregulation of interleukin-10 production, an anti-inflammatory cytokine. Ivermectin also play a role as an immunomodulator by stimulates production of the anti-inflammatory cytokine IL-10 (Pitterna et al., 2009). IL-10 is also enhanced B cell survival, proliferation, and antibody production. By all these events Ivermectin enhanced the clinical relive from infection by its effect on the angiogenesis and stop cancer progression and come into agreement with Gupta and Foley, (2015). Waters and Pober, (2013) referred to the role of the TNF-alpha to cause hemorrhagic necrosis in carcinic mass lead to cells degradation. Also the TNF-alpha factor was caused cell degradation of tumor mass which mentioned by Sun and Fink, (2007). In general the Ivermectin possess the ability to eliminate and stop at least (80)% the progression of bovine ocular squamous cell carcinoma followed by degradation, especially in an early stage by blocking the angiogenesis and lead to single cell necrosis of tumor mass and appeared histopathologically in the figure (4). The figure (1) revealed the difference between the shape of tumor mass before and after ivermectin therapy so the shape of the carcinomas (a) was appeared with high blood supply and then be pale in the late stages of treatment (e and f). This study was supported by Folkman, (1995) who is mentioned that angiogenesis, which is vital for cancer development.As well as tumor without inducing a vascular supply cannot extend beyond (2–3mm). The new vessels develop on the edge of the tumor and then migrate into the tumor. This process depends on the degradation of the extracellular matrix surrounding the tumor by matrix metalloproteinases, that are expressed in some tumor and stromal cells at high levels, on another hand angiogenesis relies on the proliferation and migration of endothelial cells. The antiangiogenic agents tend to be cytostatic rather than cytotoxic, and therefore stabilizing the tumor and preventing the spread. Also White et al. (2011) were referred to the effect of some drugs and their ability to cause programming cell death or (“Apoptosis”). This effect was revealed in the figure (5) with fibrous tissue deposition scientifically means scar formation due to the stopping of the angiogenesis,which is displayed on the left side of the figure. Ivermectin when given to mammals by injection or orally does not cross the blood-brain barrier due to the presence of P-glycoprotien which eliminate its quick absorption and toxicity; so it is safe to use (Borst and Schinkel,1996). These results did not have any side effects on the animal health along the period of treatment and the table (1) represent these tend values. 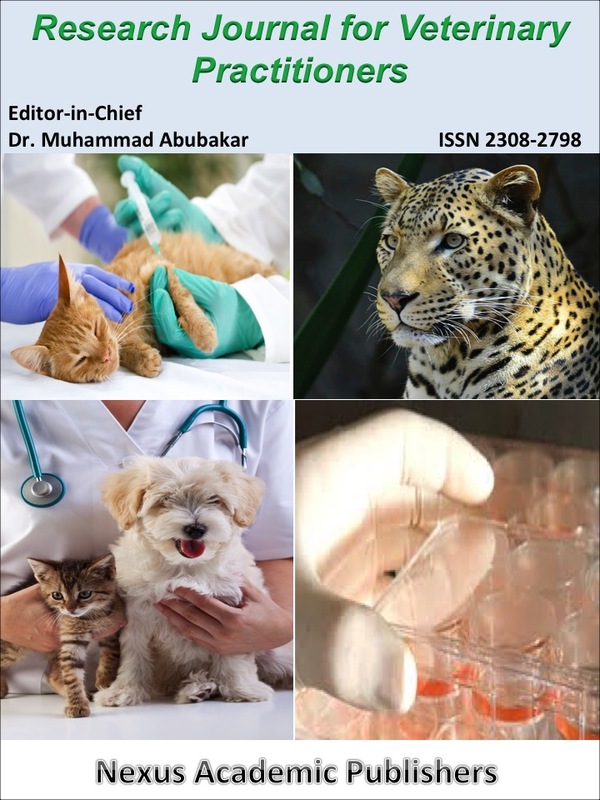 The authors would like to thanks the College of Veterinary Medicine, University of Diyalafor its supporting to accomplish this research. •	Aiello SE, Moses AM (2016). 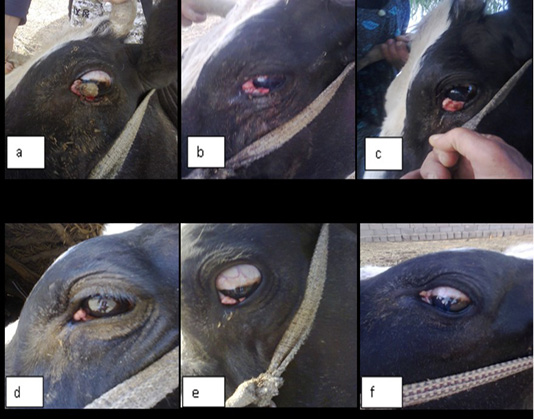 Ocular Neoplasia in Cattle. The Merck Veterinary Manual.(11th)Ed. Merck & Co., InC., Kenilworth, NJ, USA. •	Baud V, Karin M (2001). Signal transduction by tumor necrosis factor and its relatives. Trends Cell Biol. 11 (9): 372-377. •	Dubielzig RR (2002). Tumors of the eye. In: Tumors in Domestic Animals. (Meuten D.J.Ed.). Iowa State Press, Ames, Iowa, PP: 51-54. •	Gharagozlou MJ, Hekmati P, Ashrafihelan J (2007). 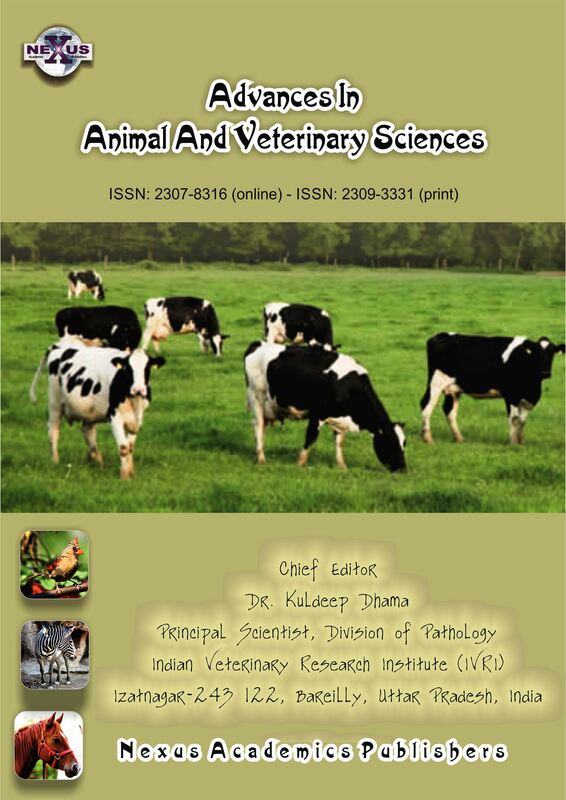 A clinical and histopathological study of oculare neoplasms in dairy cattle. Vet. Arhiv. 77(5): 409-426. •	Kriegler M, Perez C, DeFay K,Albert I, Lu SD (1988). A novel form of TNF/cachectin is a cell surface cytotoxic transmembrane protein: ramifications for the complex physiology of TNF. Cell. 53(1): 45–53. •	Perino LJ, Griffin DD, Rogers DG (1993). “G93-1184 Bovine Ocular Neoplasia”. Historical Materials from University of Nebraska-Lincoln Extension. Pp. 197. •	Quinn PJ, Markey BK, Leonard FC, FitzPatrick ES, Fanning S, Hartigan PJ (2011). Vet. Microbiol. Microbial Dis. (2ed)., P:20-21. Wiley-Blackwell, A Jhon Wiley &Sons, Ltd., Publication. •	Schalm OW, Jain NC, Carral EJ (1975). “Veterinary Haematology” 3rd. Edn. Lea and Febiger, Philadelphia. Pp. 15 - 81. •	Stewart RJ, Hill FW, Masztalerz A, Jacobs JJ, Koten JW, Den Otter W (2006). 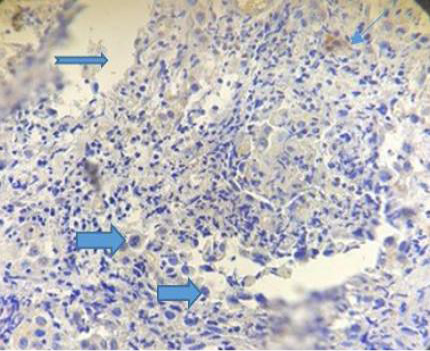 Treatment of ocular squamous cell carcinoma in cattle with interleukin-2. Vet. Rec. 159(20): 668-672. •	Waters JP, Pober JS, Bradley JR (2013). “Tumour necrosis factor and cancer. J. Pathol. 230(3): 241-248. https://doi.org/10.1002/path.4188.